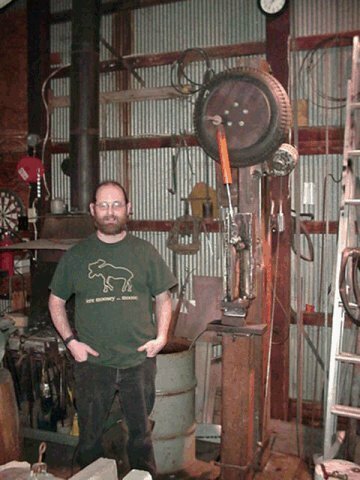 Interests:Black powder shooting, blacksmithing, bladesmithing. I am in need of a decent hammer and seems like I'll never get a chance to work in a class on these. Anybody have plans for this hammer? Or can I just copy the linkage from a little gaint? I realy like the simplicity of the design, but don't have a lot of time to"well lets see if moving this a 1/2" this way helps" I have a mill and lathe, and will have a surface grinder before long. How dificult would it be to build? Any ideas? I have a press and it's nice, but not the best for low temp forging carbon steels. Was suposed to go to a workshop last year but only six people signed up and it got canncelled. I'd love plans too. I'm in Korea most of the year. I thought about the class in Maine, but it is already full. A buddy and I built a hammer, along the lines of a Champion. We used car leaf springs for the spring linkage. The thing I was most impressed with was the fact that it worked pretty much right from the get go. We had to tinker the foot peddle a bit, but that was it. These things are not rocket science. The smiths who built them in the 19th century were good jackleg tinkerers, but not engineers. We just guessed the number of springs to use, figuring we could adjust if it didn't work, but it worked first time. If you are confident of your fabrication skills, I'll bet yours will work too. Clay Spencer, the fellow who demonstrates this design, will be doing just that at the MN Guild of Metalsmiths conference the weekend of September 15 2006. It's another option to see it done before trying it yourself. But what about a set of plans--since the thing doesn't appear to be "secret"? Or even better, what about making a DVD of one of these sessions and selling it? Looks like a Little Giant wannabe. 3/8 or 1/2 tubing for the ram..
Helper coil spring from a shock from a 4X4. If anyone has a Little Giant, could pretty much copy the mechanism. Only fly in the oilment I see is the ram guide..
braze a collar of bronze sheet on the upper and lower ram guide 2" or so, to take up the slack and act as a bearing..even brass would work. You might have to change it more often but we're smiths, we're supposed to burn things up and rebuild it....har..har..
Don' see why it would'nt work.. I love junk yard toys.. The ram guids wouldn't be a problem, the one there doing at the workshops uses ultra high density polyurithane. If I build one on my own I'll use teflon, I have access to some thick pieces that I might could mill down to act as a bearing. The head is filled with lead to get the 50# wieght. A DVD of one of the workshops would be great. So would a set of acurate plans. They are trying to get a hammer workshop going in Jackson MS, but me and two others are the only ones interested at this time, and they need about 15 people to keep the cost down. If anybody is in the Jackson area and is interested give me an email and I'll put you intouch with the guy trying to get it going. I may just have to take a tape to a little giant and see what I can come up with. The toggle on the fly wheel..looks like a pillow block..maybe 1 1/4"-1 1/2"?? Mounted to some tubing cut for for the toggle arm mount.?? I have access to about 7 or 8 round 'bridge bearings' a fellow has up on the mountain.. Solid round about..er..4" round X - about 3'?? About 250-300 lb a piece..
Has a 1" hole cut through used for the cable for hanging a bridge..
With 1/2" plate mount and dies, should bring it up to just about the right height. How did they mount the dies? The little giant linkage is ok, but this particular design may require alot of tweaking. To get around the linkage problem, I found this.. It's under JY roller hammer. Seems you could adapt the linkage and cut down alot of moving parts. I remember when Robert built that hammer. The roller guid is a nice idea, but I think the toggle link design has more merit. I could be wrong, I often am, but the toggle link should have a little more "snap" to it. The Bridge bearing should work, may want to add a little width at the bottom, like a pyrimid to add weight though. I'm not sure but I think the dies are bolt ons, but I could be wrong. If I do it I'll probably mill dovetails with a set screw. If I remember correctly, the Guild of Metalsmiths videos these demonstrations. I don't know if there are drawn plans. After the conference, there should be a copy of any videos in the library on the GoM website. They usually charge a small fee for the DVD. 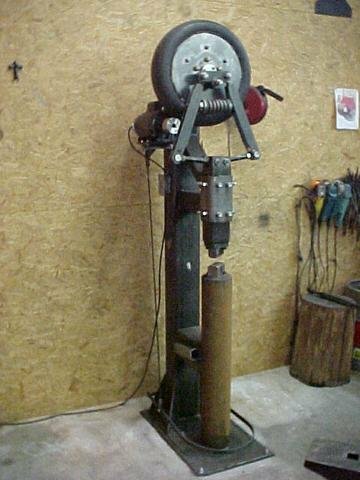 I've been wondering if one couldn't build a non-motorized, treadle version of the tire hammer??? We had a tire hammer workshop here in Tallahassee 3 - 4 weeks ago. Ron is writing article for Clinker Breaker. Will send it when he gets it done. Clay said plans would be out 'soon'. I've only used a PH once before so I really can't compare it to anything. However I'm well pleased with it so far. Clay's been saying that the plans were coming for over a year now. 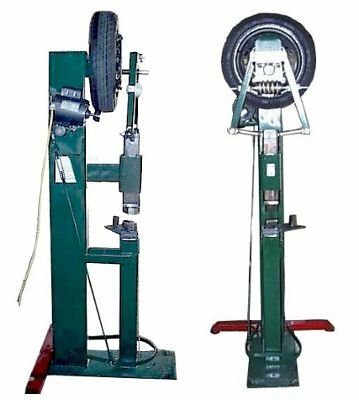 I'm about to the point of just building something along the lines of the tire hammer with a spring set-up like was shown on the roller guid hammer. I don't need step by step plans, just good acurate "blueprints" type shop drawings. As long as I know where to cut and drill I can figure out how to cut and drill. Even if 'plans' were available, the reality is, most smiths end up using salvaged parts or what is available in their own area or redesign the gear anyway. . The plans would have to be followed exactly to get a working model. That being said, once the theory is established, as you said it's a matter of cut and drill. I just got an estimate at the locate recycle steel yard. About $250 for the mainframe, ram, base and miscellanious pieces. This is with 3/8" tubing and 1/2" plate. I'm taking a trip next week and round up a 'bridge bearing' (4"X3' round ) for the anvil. Two choices one would make is.. 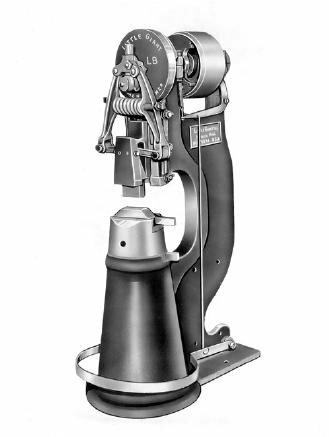 The 'Little Giant' type or spring recoil like the roller hammer. The 'LG' linkage with a little R&D could be made. I don't know the advantage of either based on the weight, throw etc. It's a gut feeling guess. From an personal artist standpoint..(if that matters..) the LG has more..er..personality and relates to an era of mechanical devices of the turn of the century. I know it does'nt make a difference as far as working capability is concerned, but, as I said, I'm an artist and like design as well as function. It is also more of a challedge to build and build it correctly. The question is bearing at the joints.. The laboratory has been doing some R&D in that area for grins and chuckles using bronze bearing and oilers at the joints. The linkage 'copies' the 'LG' as close to possiable using yard materials and stock. Adjustment is using the tie rods to an old Ford. Rather it would hold up is another question. The worse that could happen I suppose is to tear it apart and redsign. One the LG..(natch) and the Tire Hammer. Note the postiion of the linkage on the LG and position of the lower toggle arms with the ram. Note top throw adjustment on LG.. I don't make one out on the Tire Hammer (photo?). If anyone has ideas on the connection of the toggle arms and bearing, chime in.. I had an email from Clay Spencer yesterday stating that he hadn't printed anything up yet and had no idea when that would happen. I saw a version of this with a Shock used in place of the linkage. Pros & Cons? Seemed like a simple replacement although I have no idea how well it might work. Jock Dempsey over at Anvilfire.com used a shock absorber linkage on a hammer once upon a time. He says it's a bad idea, since the shock counteracts the ability to hit hard. In other words, the faster you spin the wheel, the more the shock tends to damp out the oscillations, giving you a "mushy" hit at much lower force than the "slingshot" acceleration provided by the spring/toggle arm linkage. I've thought about using a Champion-style leaf spring bow linkage for one of these, just to avoid any math in calculating the toggle length on the DuPont-style linkage. I wonder if anyone's tried a motorcycle or coil-over type shocks - say two mounted parallel to each other? Getting a pair from junked bikes should be cheap, and by using two in tandem, you might be able to compensate for the fact that they're built for lighter loads than car shocks. Maybe a Mcpherson strut? You'd have both spring and dampening - although again, maybe too much mush. Just brainfartstorming while waiting for software to load . . .
Hmmm...do you mean something like these? Here is Ron's Clinker Breaker write up about the tire hamer workshop in Tallahassee. He also sent some pics that were taken at Clay's demo at Tannehill last Dec. But it is a 1 meg file so I'm not sending it. Recon if anybody wants to see them I could post them on Flicker or Photobucket. >work done by a number of participants. >drilling and tapping the holes in the ram and anvil. >in such a sprit of cooperation with so many people. >from Homestead, Tampa, Alabama, Arizona and north Georgia. >Theforge, Anvilfire, Bituminous Bits and several blade forums. 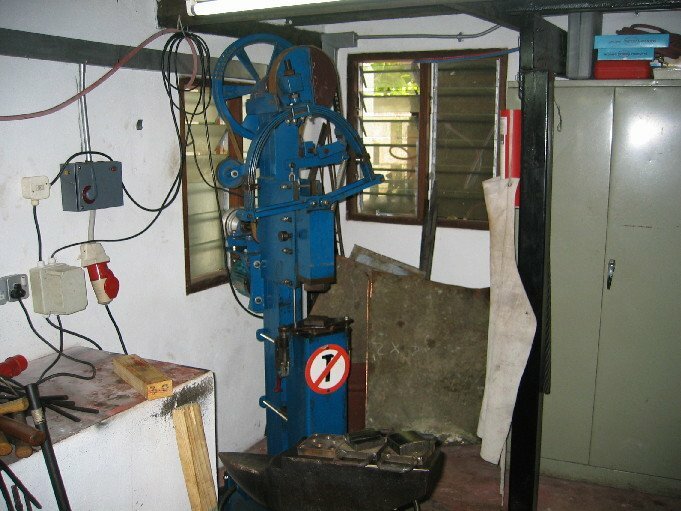 >cold saw, track torch, mig welders and other equipment. >small parts. This is an absolute necessity. >which was faster and easier than cutting with a hand-held torch. >Mike each got a hammer in the deal. >bearing keepers- Junk yard mentality = don't know/don't care; watch 'em. >those morons to match them for you. >punch the plates and the anvil, etc. >this at the debriefing) and you will have to radius the dies to suit you. measurements were close. If you do it on your own, you better measure twice. >I've forgotten, but I think the above covers most of it. What I would realy like to see is a detailed blue print of the toggle link. There are a few of us that can do precission work. I'm not a machinest, but can read a tape measure, and a caliper for that matter, and I have a set of centering punches that I made, and I stayed in a Holiday Inn last night. 1: how hard/soft/give are the springs? 3:how much ajustment, ajust where? 4:how much flywheel counter wieght, how much flywheel total wieght? 6:die sizes? Most interested in flatting, with a very slight rounding. If I can figure thouse out I've been drawing up a spring linkage design similar to the roller hammer but using two spring instead of one, and I believe I would machine bronze bushings for it. I did an experiment with linkage using bronze bushings. I need a hammer, rather it's this one or something else. If the plans are coming out I'll wait and see if it's not long in coming. If so, I'll take a shot at this or something.. It didn't sound like plans werre forthcoming any time soon. I wonder if I could simply take a tape measure to a little giant?